I eventually came around in both cases. Now I am a devotee of whole grains -- farro, quinoa, wheatberries, barley, you name it, I like to eat it. The good news for you, lucky reader, is that I am giving away a copy of this inspiring new cookbook completely free of charge! All's you have to do is leave a comment here or on my Facebook page telling me what your favorite whole grain dish is by June 12. Please make sure to tell me your email, too, otherwise, I will not have a way to get in touch to find out your mailing address if you win and that would truly be tragic. Okay, I need to stop now or I'll just end up copying all of the recipe titles out of the book... The gist is that it all looks good. Really good. Maria is from Greece originally and her recipes have a little exotic kick to them that makes them more interesting than most. So leave me a comment telling me your favorite whole grain dish and your email address and I'll enter you to win a free copy of Ancient Grains for Modern Meals . The deadline to enter is Sunday, June 12th. I will choose a winner at random and email her or him to get the address for where to mail the book. Lovely! I just got this cookbook from the library and so far, the recipes are so tantalizing! Could I really narrow down to my favourite grain dish? I am partial to my wheatberry salad with cranberries and spinach in a citrus-dressing.... and my bulgur salad with roasted tomatoes, chickpeas in a pomegranate dressing. Yum! I'm just getting into grains more -- my favorite so far is quinoa with black beans and tomatoes, spiced with cumin and lime juice. The cookbook looks great! Great Idea! I fell in love with wild rice in Minnesota (the real stuff, harvested by canoe on the lakes by the Ojibwe) and so anything with wild rice, but especially when it contains dried cranberries, walnuts and celery! Red Quinoa tabouli is another fav! 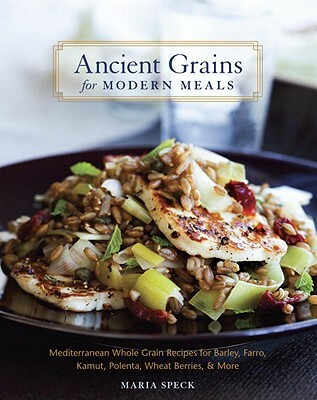 This book looks amazing...my favorite grain salad is tabbouleh :) cool and so flavorful! My favourite grain meal is also tabbouleh, which I make with quinoa. I wowed a difficult crowd with this pot luck offering. No one guessed the grain. My favorite is short grain brown rice. Yep, just plain old short grain brown rice. It's versatile, if I don't want it as a side to steamed greens or stir-fry or something, it makes a great salad. My favourite grain dish is a chickpea, artichoke and wheatberry salad with tomatoes, olives and capers. Man. It's so good. I could eat buckets of it, I tell you. BUCKETS. Oooooh this looks like a great cookbook. I've been on a southern cookbook frenzy of late, so I'd love to try grits and also southern grown Carolina rice. I'll have to try Kirsten L.'s recipe as I have celery growing in my garden (easy, but slow to germinate) for the first time this year. What an interesting list of recipes in this book. I'd love to have a copy to expand my repertoire. Right now my favorite whole grain is amaranth and I make up a big batch and then add different vegetables to it. Quinoa tabbouleh. Lemony goodness. But I also love to eat bowls of plain brown rice, yum. My favourite grain dish is a tabouli I make using black quinoa - which looks incredibly dramatic with the tomatoes, yellow peppers and huge amounts of parsley and mint. Barley soup with mushrooms is one of my favorite dishes. I cook with a lot of Pearl Barley. I make a lot of soups, and will just add 1/2 a cup or so. Pearl Barley goes well in vegetable-type soups, or a mushroom soup. Beef barley soup is good also. I've started to use more whole grains like farro, quinoa, and wild rice for salads and side dishes, but my favorite traditional dish with a whole grain is beef and barley soup. For me it's a comfort food that I remember from childhood, when my Russian grandmother, who lived with our family in Chicago for several years, served it on cold blustery days. Root vegetables like carrots and turnips, some herbs, an oxtail or beef soup bone and barley, simmered for hours made our kitchen cozy, and our family happy and healthy. Ooh, this cookbook looks amazing! I eat a lot of whole grains, and I'm always looking for new ideas. "Rice bowls" are my go-to emergency meal after a long day at work -- some kind of grain as a base (I love wheatberries or Massa Organics' short grain brown rice), sauteed veggies (whatever's in the fridge from the farm box), baked tofu or poached eggs, some kind of sauce (peanut sauce, salsa, olive oil and vinegar, etc). I'm also a big fan of wheatberry salads with cranberries, roasted butternut squash, spinach and an orangey dressing. This book sounds great! I love a wild rice, leek, mushroom soup that was in the magazine section of the LA Times Sunday paper back around 1982. Our friend served it with green salad and the meal still makes me swoon. I've made the soup many times since and it is rich, and satisfying. Wild rice is beyond peer. I also love my simple brown basmati rice pilaf with almonds, peas, onions, and dried cranberries. Simple, elegant. Thanks for your great blog! I've been wanting to try Quinoa, some of those recipes you mentioned sound awesome. Congratulations to Nicole Harter! You've won the copy of this delicious cookbook.